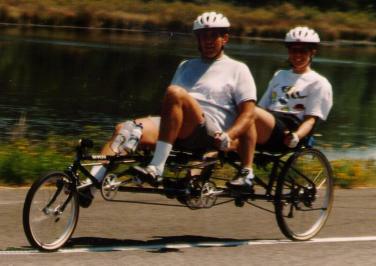 Shirley and I ride a tandem every day. We ride our Ryan Duplex and our Co-Motion Co-Pilot on the alternating days. We love both tandems and we would be hard pressed to choose between them. Alternating allows us not only a fun change but it gives our muscles added recovery time. If we ride the same bike on consecutive days we typically feel some residual muscle fatigue. If we change bikes our legs feel fresh. We like the Ryan because it's comfortable and fun to ride. It looks like it might be hard to maneuver but after a short learning period it really isn't. It is easy to handle and is very stable at high or low speed. The under seat steering is extremely comfortable and easy to use. It's the best I have seen on any recumbent. It uses bar end shifters that stick up so they are always at my fingertips and easy to use even with heavy gloves in the winter. The brakes are equally accessible without repositioning of my hands. I recommend the Ryan to anyone that would like to add comfort and variety to their riding. 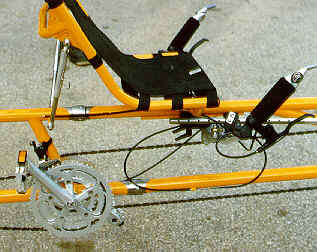 Conventional tandem case The Pedal Pack case shown here was designed to carry a full size conventional tandem built without S and S Couplings. Although the Ryan SS Duplex is transportable in this case, it exceeds the maximum size for UPS so shipping the bike can be a hassle. 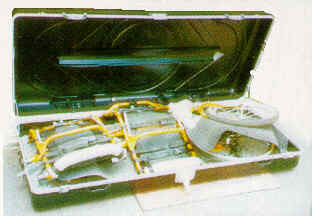 "SS Duplex" in a Pedal Pack hardshell wheeled tandem carrying case. Alternate method. The Ryan has also been successfully packed into one 58"x26"x10" box which is within the UPS limit. "SS Duplex" packed in a single box. See the Ryan packed step by step into the box.